Search Highway 285 homes for sale below! Browse our newest listings today! Situated just outside of Lamy and Eldorado at Santa Fe, lies the beautiful extension of Highway 285. The expanded Eldorado & Highway 285 includes many subdivisions– Belicia Estates, Alteza Estates, Dos Griegos, Los Vaqueros, Old Road Ranch, The Ridges, and Sun Ranch Estates. These nearby communities include more affluent homes and larger lot sizes. Potential homebuyers are eager to purchase a property here because of the neighborhood's proximity to big city amenities, the stunning mountain views and the private and secluded landscapes. And if you're an equestrian enthusiast, you'll love these exquisite properties. Read more about Highway 285 homes for sale or search the listings below. Be the first to see Highway 285 real estate listings & gain access to advanced search tools. Register with Santa Fe Properties to get started! Imagine a luxury high desert retreat situated on over 30 acres of land. This could be a reality if you invest in Highway 285 real estate. Homes for sale in the Highway 285 South area range from the mid- $200,000s to well over a million dollars. Inside these properties, you'll find an abundance of thoughtfully designed floor plans. These rooms are large and commanding, yet elegant and cozy. And there are many formal fireplaces, vigas, and corbels, adding tremendous amounts of Puebloan character. Located in the Highway 285 Corridor is the visually rich Galisteo Basin Preserve, a nationally-acclaimed conservation initiative located in Santa Fe County's Galisteo Basin. The Galisteo Basin Preserve is planned to conserve and restore more than 13,000 acres of open space as well as promote thoughtful, stewardship-oriented community development. 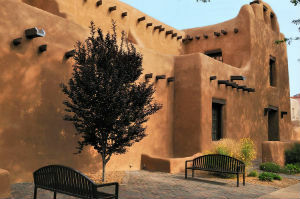 Contact Santa Fe Properties for more information about homes for sale near Highway 285 in Santa Fe, New Mexico. Or to schedule a viewing, simply give us a call at (505) 982-4466.